Oh boy, I'm really excited for this guy. Yesterday Riot officially unveiled Ivern, the Green Father and I couldn't be more ecstatic. I've been a jungle main since around Season 3, preferring support prior to that and when I play with Slooze currently. That being said, Ivern is being dubbed "the true support jungler", and his kit is crammed with utility and aid for his fellow champs. Ivern, much like the last batch of champions, is incredibly unique, bringing a whole bunch of new mechanics and a completely new style of jungling. Let's go over his kit! "Ivern loves jungle monsters and would never harm them. instead he sets them free! Clicking on any jungle camp creates a grove using some of Ivern's health and mana. The grove matures over time; when fully grown it can be clicked on again to free the camp's denizens, granting Ivern gold and xp. Smiting a camp with a grove instantly sends the monsters to safety. After level five, the Green Father creates copies of the red and blue buff whenever he frees Red Brambleback or Blue Sentinel - they'll leave behind a sapling which can be picked up by allies." This is insane. 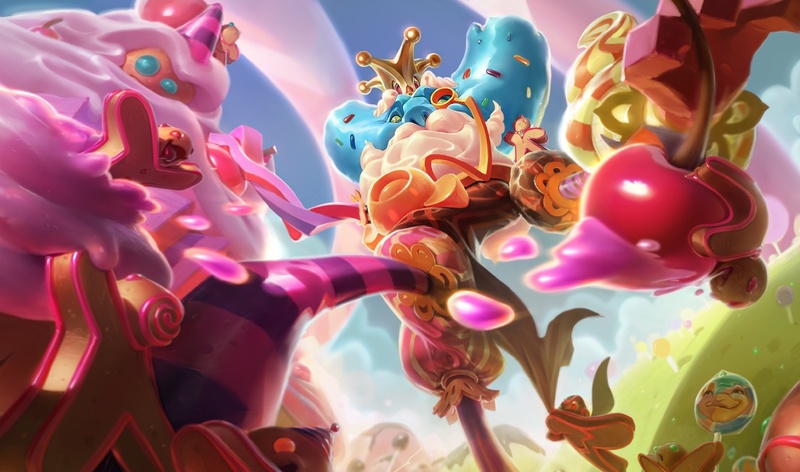 Not in an overpowered way, as this system has it's weaknesses, but this completely changes the way junglers will have to think while playing Ivern and against him. 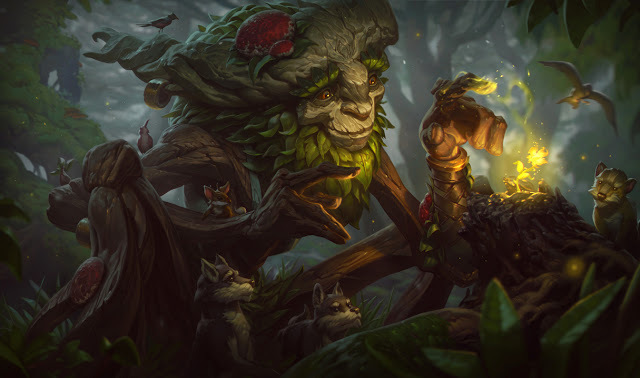 Counter jungling becomes a much bigger part of the game, as enemies will attempt to encroach on Ivern's groves and Ivern will attempt to create groves in the enemy jungle. This passive will also allow Ivern to create unique paths through the jungle, as he will need to double back to "free the denizens" of the camps once the grove is ready. "Ivern shoots out a ropey root that deals magic damage and (as you'd expect) roots the first enemy it hits. Allies who use a basic attack on the rooted target will automatically dash to get within attack range." Rootcaller is Ivern's primary ability for securing kills. Snatching an enemy while you have nearby allies is kill secure or at the very least some summoner spells blown if your team has enough damage. "Passive: When hiding in brush, basic attacks have increased magic damage and range. This effect lasts for a couple seconds upon leaving the brush. Active: Ivern creates a patch of brush, temporarily revealing the area around it. The amount of brush created is slightly greater if it is placed near a wall or any other brush. The Green Father's grassy patches disappear on their own after a moderate delay." Ironically enough, during Ivern's initial cinematic teaser, I totally predicted this ability's active. I think this is my personal favorite part of Ivern's kit, as it has so many uses and forces the entire game to be played differently. Placing brush can be used to bluff, obstruct vision, bait wards, etc etc. It has so much potential, and on top of the abilities passive, Ivern can help fight too! "Ivern places a protective seed onto his ally, granting them a shield. After a short delay the seed explodes, damaging and slowing all nearby enemies." Triggerseed is pretty self-explanatory. Good for helping your allies disengage or slow down an enemy in pursuit. "Ivern summons Daisy, an enormous sentinel who loves hugs. Daisy scampers around joyfully, knocking up Ivern's target after a few hits. Ivern can recast this ability to redirect his boisterous friend toward new targets. She'll hang around until her hankering for hugs has been satisfied or her health bar has been depleted." Daisy! is an interesting ability. One part Annie's Tibbers and one part Braum ultimate, Daisy! will definitely cause a ton of havoc during team fights. Ivern's release skin, "Candy King Ivern"
I haven't had the chance to play Ivern yet, but I will as soon as I can. My PBE account is "GreatSaltSage" and I'll try to at least mess around with him in custom games to avoid the instalocks. I think Ivern has a ton of potential to be played a lot differently then other junglers and disrupt games in a really unique way. On Riot's reveal page they mention an interesting strategy involving teleport that I will work on myself. On top of jungle routes, Ivern's Brushmaker makes me giddy with possibilities, not to mention his passive ability to share buffs throughout. When League champions come out I usually like their design and play them a bit but recently I haven't LOVED any of the recent champions. I think I'm going to love Ivern. If you have any questions about his very...odd...kit, or anything to mention let me know in the comments! I'll definitely be writing a jungle guide for The Green Father soon. Stay tuned!